Hi guys, I’m Erin, a 26-year-old rider, graphic designer, and seeker of adventure, currently living in Petaluma, California and I am so excited to share my wildest adventure yet with all of you! Now just to preface this, it is fairly well known amongst my peers that I am a total adrenaline junkie and lover of all equine endeavors… About 4 years ago, I was sitting at my SmartPak desk, working away, when a coworker stopped by and told me that he found a super cool company that hosts this crazy horse race that was practically built for me. So, I checked it out. 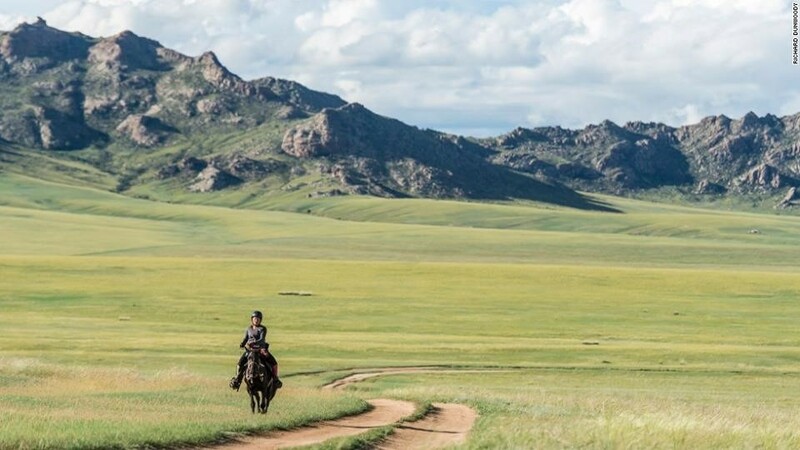 The Mongol Derby…I had stars in my eyes the second I clicked through to the website and saw the gorgeous images of vast landscapes and stocky little, crazy-maned steeds. I started reading even though I was already 100% on board before I knew the parameters of this wild adventure. I mean…who wouldn’t be? Look at all that wide-open space! This is every horse girl’s dream!! The Mongol Derby, deemed the longest, toughest horse race by the Guinness Book of world records, is a 620-mile multi-horse race across the Mongolian Steppe. The goal is to cross the finish line in less than 10 days. With no marked trail or set route and only an 11-pound allowance for gear, we’re talking a real Hidalgo-like situation. The Mongol Derby was inspired by Ghengis Khan’s Postal Route where riders would travel across the steppe from check point to check point where a new, fresh horse would be waiting for them to continue on the next leg of their journey. Sound pretty cool, right? But is it…? Ten straight, long, grueling, 13 hour-days in the saddle and relying on nomadic herding families for food and a place to sleep makes this trek no comfortable, leisurely vacation ride. 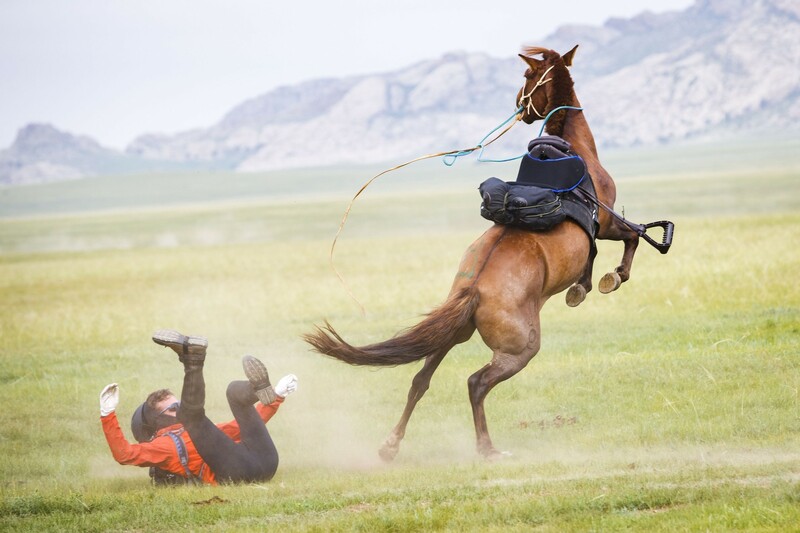 Between gnarly falls from trying to stay on your 25 different half-wild horses, getting chased by wild dogs, galloping full speed in marmot hole-riddled fields, dehydration, food poisoning, unmarked trails and unpredictable weather, only about half of the riders are expected to finish. Naturally, I HAVE to do this race. So, fast forward a few years of me constantly checking the website and closely following the race, saving up my pennies so one day I can be in those beautiful pictures on the website, I accepted a new job on the other side of the country and had a little goodbye dinner with my SmartPak coworkers that had become good friends. Right before I left, I told them, watch out for me, 2019 is my year for the Derby. Fast forward again, 2018 is winding down and I have settled into my new job and my new home in a new state and wow, it’s almost 2019 and I have to keep my word! So, I applied for the Derby, not really thinking I would ever get selected as one of only 40 international riders to compete in this absolute madness. Next thing you know, I got a message saying they passed my application and wanted to set up a time for interview. A few weeks later, I was offered a spot, out of hundreds of applicants, in the longest, toughest horse race in the world. Follow me along this wild, once-in-a-lifetime journey and check back here on the SmartPak Blog for more updates or like my Facebook page, Erin Vs The Derby.